Our flight landed mid-afternoon in Melbourne and while we’d expected it to be cooler than Uluru, it was a good bit cooler than Sydney too. Not cold, but long sleeves and a light jacket felt good in the evenings with the wind. 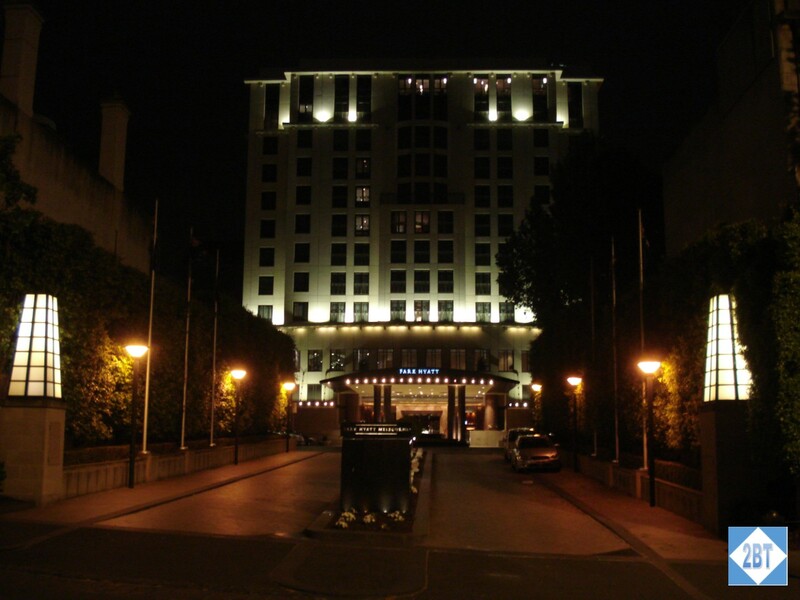 We took the Sunbus Melbourne from the airport to the Park Hyatt. Their representative showed up near baggage claim very shortly after we got our bags, which was great timing. We then had to traipse over to the international terminal to find the remaining passengers for our van and then we all played “follow the leader” out to our shuttle. Naturally we were one of the last groups to be let off at our hotel but we were warmly greeted by the bellman at the Park Hyatt Melbourne. He took our big bags as we went inside to check in. The front desk is located to the right of the main entrance and is staffed by delightful, helpful folks. They confirmed our club room and that we would have breakfast included and gave us our keys. We arrived in the middle of a Tuesday afternoon during the third week of October and it was HOT. I cannot even imagine how it feels in the middle of the summer. My advice: stick to visiting in mid-April to mid-October (Autumn through Spring) and skip the summer months. 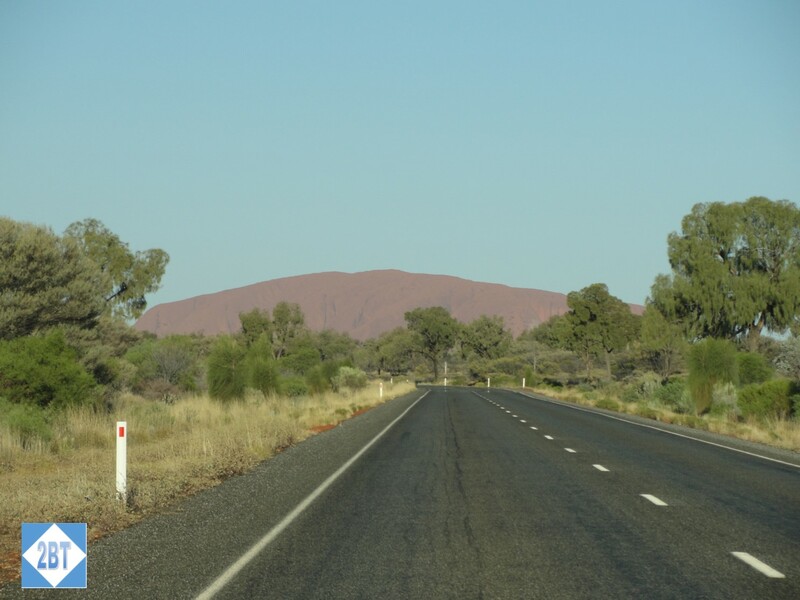 The park is about a 10-minute ride from the Ayers Rock Resort and entry is at a single ranger station. Each person in the vehicle must have a park pass so if you get behind several cars where people do not have passes, the line can back up. Park passes start at $25 AUD for a 3-day pass which should be all you need. If by chance you’ll make more than one trip to Uluru during a year’s time, opt for the annual pass at $32.50 AUD. Uluru itself is about a 10-15 minute drive from the park entrance. As we were driving towards it we could occasionally catch glimpses of it in the distance and then we came around a bend and there it was. Pictures really don’t do it justice and I wanted to pull the car over right there and then and start taking photos. Apparently a lot of other people had the same idea because there were “No Stopping” signs all over the place! Well, at least I was in good company with my idea. 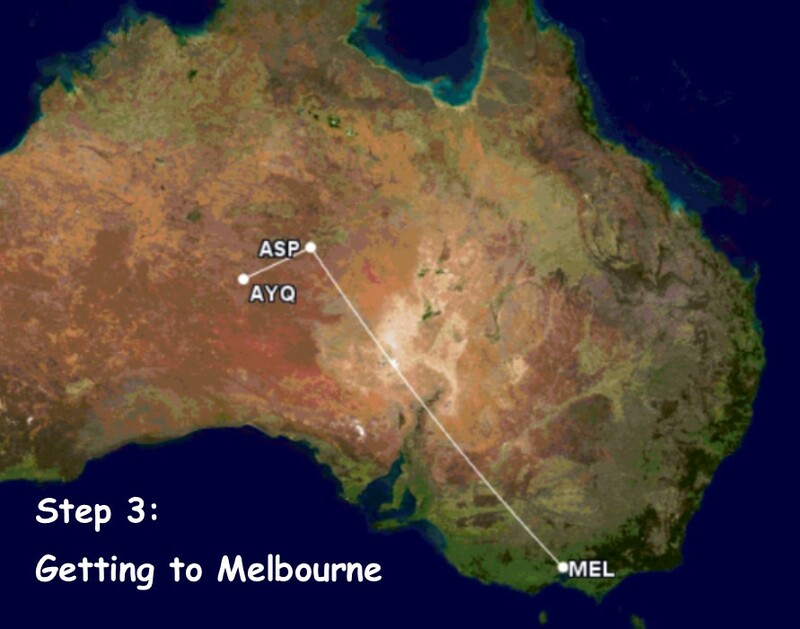 We arrived at the tiny Ayers Rock (AYQ) airport on time and were happy to get inside the terminal to wait in air conditioned comfort for our bags. There is only one terminal at AYQ with two gates (if I recall correctly) and one belt in baggage claim. No way to get lost here! We picked up our rental car and began the drive to the resort. It was my first effort at driving on the “wrong” side of the road and I was very happy that we were out in the middle of nowhere so I’d have plenty of notice of approaching vehicles and since we had a small SUV, we could even pull off the road entirely if needed. Fortunately I managed to keep it on the road in the correct lane for our time there. When booking lodging in the Uluru area, there’s one company that handles all requests. The Ayers Rock Resort has lots of different types of lodging from the rustic Outback Pioneer Hotel to the luxurious Sails in the Desert. Since we were paying for this stay (albeit with a discount thanks to Barclays ArrivalPlus points) we chose the Emu Walk Apartments, which is a step or two down, luxury-wise, from the Sails in the Desert but definitely above the Outback Pioneer Lodge. 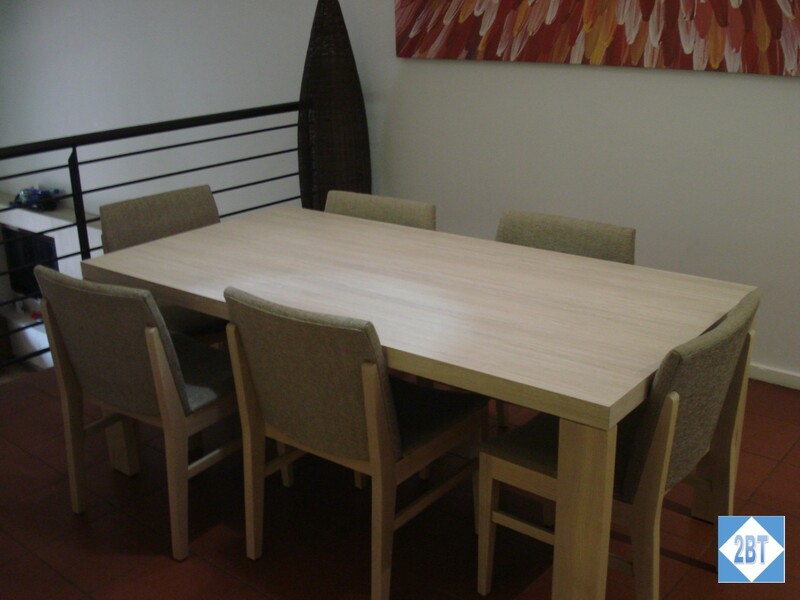 We chose a two-bedroom unit which would give us room to spread out as well as a breakfast area. The second bedroom was supposed to have twin beds though in the end it did not. Fortunately the sofa was relatively comfortable as a third bed since we were only staying two nights. Our travel dates were during the third week of October, so well into Springtime. Temperatures were very warm during our stay, in the mid-90sF/mid-30sC and our air conditioner managed to keep pace, though it ran very steadily during the day. At night the desert cools off quite a bit which helps keep things cool enough to sleep. Our particular apartment was a split-level: there were no stairs to the front door and immediately upon entering the kitchen was to the right and the second bedroom to the left. Just beyond that, the dining area was on the right and the bathroom was to the left. Down a set of 4-5 steps was the living area and the master bedroom to the left. Our flights from the US landed very early in the morning so it was still early in the day by the time we got settled in our hotel. In an effort to stay awake, we decided that walking would be a good idea. We walked around The Rocks, the area near the hotel, and noticed lots of little restaurants. There were also tents being set up for a weekend fair with lots of booths of food and crafts. After browsing around there a bit we decided to walk to Darling Harbour. It’s quite a hike but we enjoyed being out in the warm weather. One thing that’s always fun about being in a different country is how proper names that are not unusual for the area sound so very different to my ears. 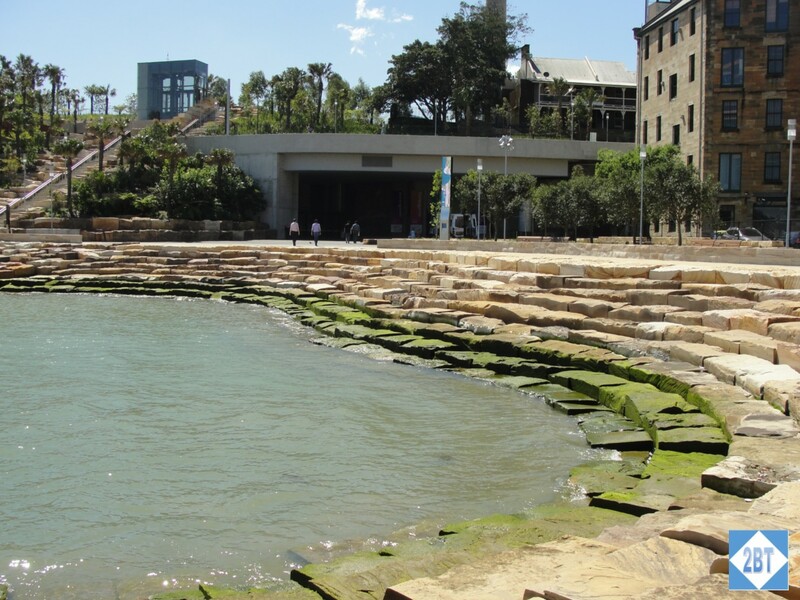 On our walk we passed the Barangaroo Reserve, a small park with stone steps around the edge of an inlet. I enjoyed just letting the sound of that roll through my head “Barangaroo”. It’s a fun word! This would be a nice place to have a sack lunch or sit and read a book. We’d veered from the road to walk through the reserve, hoping its path would take us along the water but we got to the end of the park only to discover a barrier as construction was underway on several towers, so we had to re-trace our steps back to the road. 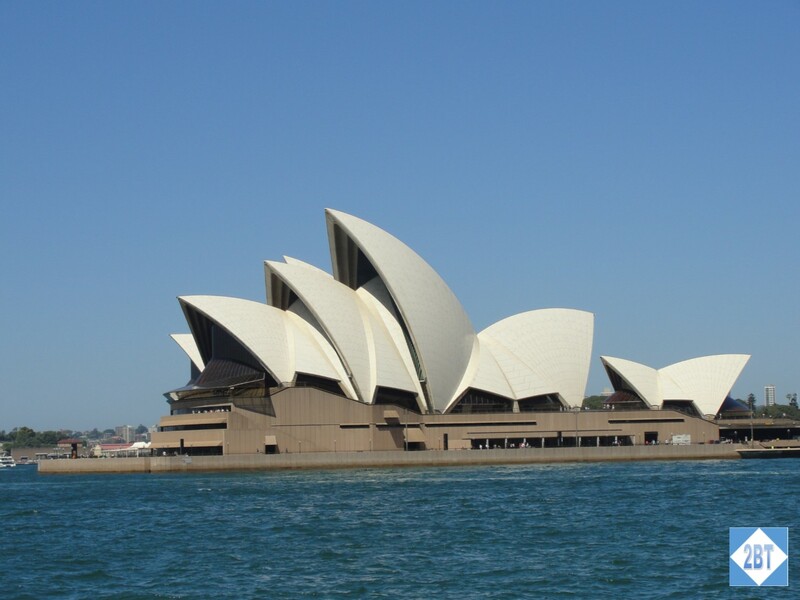 A few days before we left on our trip I happened to notice a tweet that the Sunday we’d be in Sydney was the one day of the year that the famed Opera House held its (free) open house. On my previous visit to Sydney I’d paid to take a tour and hoped to convince my friends that it was worth it but this was even better, even if we did have to line up early on a Sunday morning.